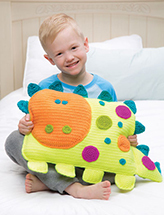 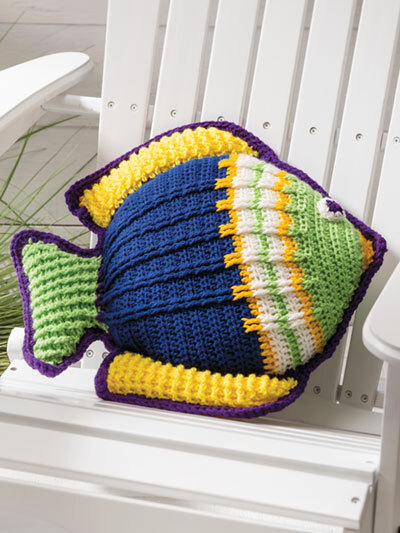 Crochet this fish-shaped pillow in bold colors and add an unexpected touch of tropics to a sun room or beach cottage. 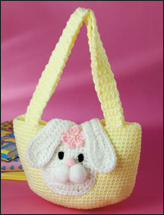 Design is made using Red Heart Classic #4 worsted-weight yarn, 2 skeins of #849 Olympic blue, and 1 skein each of #3 off-white, #230 yellow, #596 purple, #1270 golden yellow and #1625 lime. 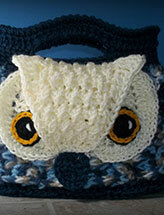 Size: 18"W x 18"L x 5"deep.